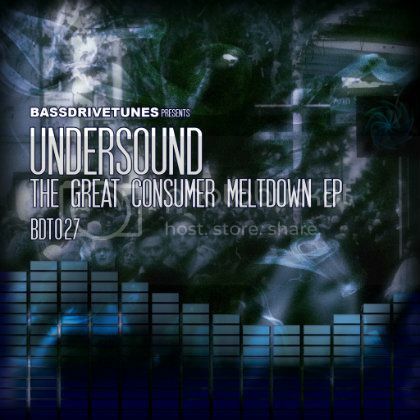 BassdriveTunes is very pleased to present its latest release - “The Great Consumer Meltdown” EP from Cardiff, Wales-based producer Undersound. Just like Undersound’s previous 3 releases on the BassdriveTunes label, The Great Consumer Meltdown showcases his diverse and expansive production talent, fusing elements of each facet of the drum & bass genre with other influences to create a style uniquely his own. “The Great Consumer Meltdown” EP starts firing on all cylinders with the haunting and emotional “Broken Peace Is?”, featuring vocalist Nicki Rose. In combination with Rose’s flowing vocals, the track builds into a tremendous drop and textured bassline, instantly ensnaring the listener with heartfelt feeling and dancefloor energy. “Treading the Boards” gives a nod to the harder styles of drum & bass with its pulsating aggressive bassline while still maintaining a flowing atmosphere and composition. Next up, “Listening to Dreams” combines a unique vocal with tasteful guitar licks and ambient vibes which beckon until it is met with a massive explosion of drumwork and a growling bassline, offering a complex interplay between melody and darkness. “In Bloom” showcases the more melodic side of Undersound, with a sultry female vocal leading into a beautiful melody backed by heavy stepping percussion. The next track, “The Distant and the Lonely", demonstrates Undersound’s uncanny ability to write for the dancefloor while effortlessly maintaining an addictive funkiness that permeates the entire composition. Finally, the title track “The Great Consumer Meltdown” pulls out all the stops for an all-out bonanza with running percussion and a synth and bassline combination that is sure to have everyone’s hands in the air. 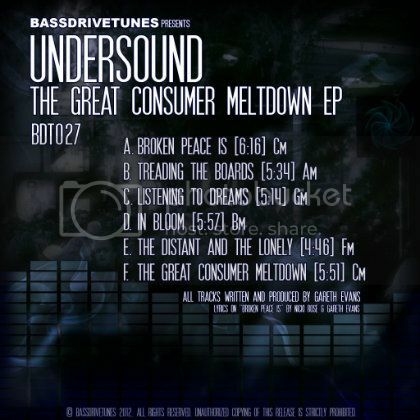 [BDT027] Undersound - “The Great Consumer Meltdown” EP is OUT NOW and available at all your favorite digital music stores! Check it! Thanks for the link that you have shared with us.